Time to update golf's roster of current stars, with the 2017 Pro Season cards for HISTORY MAKER GOLF! Over 150 of the tour's real-life stars, from the top money-winners to the hangers-on and hopefuls, NOW AVAILABLE! There were epic finishes at Augusta, GA, and Lancashire, England. Golfers like Garcia, Johnson and Schauffele made the most of their time in the spotlight, while Spieth and Thomas showed consistency and excellence the entire year. Golf fans savored thrilling "Cinderella Stories" at tour stops like Wilmington, NC, Ponte Vedra Beach, FL, and Dublin, OH. You'll enjoy the same kind of excitement, albeit perhaps with different golfers at different events on your tour, with the 2017 Pro Season cards for HMG! You'll have a great time watching your season unfold, as the world of pro golf comes alive on your game table with this realistic collection of cards representing today's pro golf scene. Who'll win top honors at your Pro Open, or the green jacket at your version of Augusta? You'll experience tension and drama as your season winds down, with the top guys on your money list scrambling to move up a notch or two, or hanging on for dear life! Over the long haul, 2017's top golfers are going to impress on your tabletop, displaying the consistency and skill that made them the year's brightest stars. Similarly, the second-tier golfers will have their moments, too! 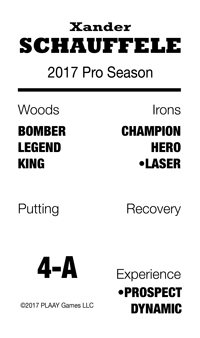 The 2017 Pro Season cards will revisit the actual 2017 pro golf season and give you a true-to-life rendition, with your own unique twists and turns. Every card reflects each golfer's real-life skill set, capturing abilities (or deficiencies) in shot-making, distance and accuracy, putting, short game and everything else! The golfers are rated for their actual tournament standing, which when used in conjunction with HMG's "Tournament Mode" will ensure that the top golfers show up most often as your final round contenders, while allowing for the rest of the field to have their shot, too. Intangibles will factor in, adding a fun element of unpredictability and surprise to your schedule of events. Experience comes into play, too—you'll see journeyman pros rise to the occasion by drawing on veteran "smarts," while the highly-touted young stars occasionally make "rookie mistakes!" It's all part of the fun of tabletop pro golf, with the 2017 Pro Season cards for HISTORY MAKER GOLF. The 2017 Pro Season for HISTORY MAKER GOLF includes 162 individual golfer cards, roughly the top three-quarters of the just-finished pro season, and sells for $19 postage-paid. NOW AVAILABLE!